This tutorial provides an insight look at the Media Manager feature in Joomla and explains how to use it. Log into your website as administrator and navigate to the Content tab and then Media Manager. When you enter the name of your new folder, simply click on the Create Folder button and the system will complete the rest for you. Select a folder, where you would like to upload the new file. In our example, we have selected the newly created folder "Test" in Step 2. Click the Upload button at the top-left side of the screen. This will allow you to choose a file from your personal computer. 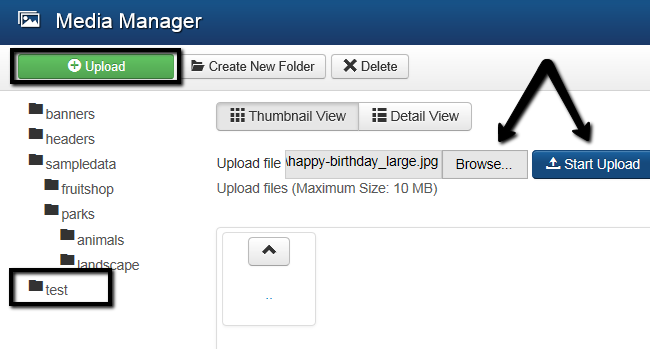 When you select the file, simply click on the Start Upload button, which will initiate the process for you. To remove a file via the Media Manager, you simply need to select it and then click the Delete button on top. The same process can be used for multiple files as well. Simply select all files and click the Delete button on top.